Enamel is the uniquely organized outermost covering of the tooth and is predisposed to numerous challenges within the oral environment. However, mature enamel cannot be regenerated due to lack of functional capacity of ameloblasts. Owing to this inherent limitation and any drop in pH below the critical value begins the demineralization process. Once a certain degree of demineralization has occurred the lesion will appear as white spot. This marks the process of caries initiation with most of the mineral loss from the subsurface area and a relatively intact superficial layer. These lesions can be clinically detectable as well as remineralized noninvasively. After approximately 30% of demineralization, the mineralized surface collapses and breaks irreversibly. Hence, early detection and management of these incipient lesions with remineralizing agents are recommended. Various remineralizing agents are available for noninvasive management of incipient lesions. However, these agents fall short of achieving matrix-mediated mineralization similar to the natural process. To overcome this, self-assembling peptide (SAP) P11-4 was developed to regenerate enamel by providing matrix-mediated mineralization. These short-chain peptides have the property of assembling into a three-dimensional structure resembling the extracellular matrix, thereby promote regeneration. As there is little information available on remineralizing efficacy of SAPs, a study was planned with an aim to assess and to compare the remineralizing efficacy of novel biomimetic SAP P11-4, with casein phosphopeptides-amorphous calcium phosphate (CPP-ACP) on artificially induced enamel lesions. Enamel samples were prepared from 12 recently extracted human premolars in children requiring orthodontic treatment. The samples were stored in 10% formalin solution until use. The root portions were dissected at the level of cementoenamel junction [Table 1], and crowns were made into two halves by sectioning them in mesiodistal plane with intact buccal and lingual surfaces using a low-speed diamond disk. Thus, the obtained samples (n = 24) were allocated randomly into two groups with 12 samples in each group [Table 2]. Artificial enamel lesions were created by placing a 4 mm × 4 mm wax sheet on the tooth surface, and the remaining surface was coated with acid-resistant nail varnish, later the wax sheet was removed, and the samples were stored in demineralizing solution for 4 days [Table 3]. The samples were then subjected for scanning electron microscopy (SEM) and energy-dispersive X-ray (EDX) to evaluate the structural appearance and elemental concentration of artificially created enamel lesions which served as a baseline data. According to manufacturer's instructions, the samples of the test group (P11-4) were etched with 37% phosphoric acid for 20 s and rinsed thoroughly with water, the surfaces were dried; later SAP P11-4 was applied on the tooth surface with a brush and allowed to diffuse for 5 min. In Group 2, the sample surface was dried, and a sufficient amount of CPP-ACP was applied on the tooth surface with gloved finger and left undisturbed for 4 min. Artificial saliva was used for the storage of samples at room temperature. The solution was changed for every 14 days to prevent bacterial contamination. SEM and EDX evaluation was done to assess the amount of remineralization at 1-week, 1-month, and 3-month intervals. EDX spectrometry was used to determine calcium and phosphorus weight % of the samples. The calcium and phosphorus content was then converted into Ca/P ratios for each group. Data were statistically analyzed using ANOVA and unpaired t-test. In test group (P11-4), calcium phosphate ratio decreased at 1-week (1.71 ± 0.13) interval compared to baseline (1.73 ± 0.15). The ratio gradually increased at 1-month (1.74 ± 0.11) and 3-month (1.95 ± 0.10) evaluation; however, at 3-month observation, the difference was found to be statistically significant compared to baseline. On the contrary, with CPP-ACP group, a significant increase in Ca: P ratio was observed at 1 week (2.04 ± 0.2) itself, and then gradually the ratio reduced at 1-month (1.86 ± 0.14) and 3-month (1.87 ± 0.11) intervals. However, the increase in Ca: P ratio at all the intervals is significantly higher when compared to baseline. On comparing Ca: P ratios with P11-4 and CPP-ACP groups at three intervals, a higher Ca: P ratio was found with CPP-ACP compared to P11-4 at 1-week and 1-month intervals which are highly significant (P = 0.000). However, at 3-month intervals, it is noticed that a higher Ca: P ratio was seen in P11-4 group compared to CPP-ACP which is statistically significant (P = 0.027). Demineralized enamel samples [Figure 1]a and [Figure 2]a: in both the groups, after demineralization evidence of porosities with increase in pore volume were seen suggestive of demineralization. SAP P11-4 [Figure 1]b, [Figure 1]c, [Figure 1]d: remineralization was noticed at 1-month interval with evidence of ion deposition around the prism, and a reduction in pore volume was noticed. However, at 3-month interval, uniform ion deposition was found resembling natural enamel surface suggestive of hydroxyapatite nucleation. CPP-ACP group [Figure 2]b, [Figure 2]c, [Figure 2]d: mineral deposition was noticed around the demineralized enamel prisms with reduced pore volume at 1-week interval. On 1-month and 3-month observation, although ion deposition was seen, irregular deposition with globular arrangement of ions was observed. Incipient lesions manifest as early signs of caries activity. These lesions clinically appear as a white opaque spot and are softer than the adjacent sound enamel. They are capable of being reversible. Remineralizing agents being marketed fail to regenerate enamel by simulating the natural mineralization process. Understanding the basic principles of matrix-mediated mineralization paved a way for the formulation of biomimetic enamel remineralizing agents such as SAP P11-4. In the present study, the remineralizing efficacy of SAP P11-4 was compared with CPP-ACP both qualitatively and quantitatively using SEM and EDX, respectively. EDX is a spectroscopic technique which determines the presence and relative abundance of the elements that are present in the specimen whereas SEM produces images of sample by scanning the surface with a focused beam of electrons. Although atomic force microscopy (AFM), scanning tunneling microscopy, and profilometry can be used to determine enamel surface characteristics, SEM and EDX were used in the present study as they determine the ion concentration and surface morphology in noncontact method. Studies conducted to evaluate the remineralizing efficacy of P11-4 using AFM studies and by clinical evaluation showed effective remineralization at 3 months. We preferred three-time intervals to understand the pattern of remineralization and analyze the mineral content (Ca: P ratio). Initially (at 1-week interval), SAP P11-4 showed a decrease in Ca: P ratio compared to baseline value. This could be attributed to additional acid etching before the application of P11-4 as recommended by the manufacturer which could have caused further loss of minerals from the tooth surface. In contrary, CPP-ACP initially had shown an increase in Ca: P ratio with evidence of mineral deposition and reduction in pore volume on SEM evaluation at 1 week. Similar observations were noticed when the remineralizing efficacy of CPP-ACP was evaluated at different time intervals with EDX and SEM, it was found that CPP-ACP showed increase in Ca: P ratio at 1-week interval itself. However, contrary findings were reported in a study done by Lata et al., where surface microhardness evaluation of CPP-ACP following single application did not show effective remineralization after 5 days. Although both remineralizing agents had shown comparable evidence of remineralization at 3 months, SAP P11-4 demonstrated improved mineral content with surface morphology resembling natural enamel on quantitative and qualitative evaluation. The findings of the present study promptly reveal the quality of remineralization produced with SAP P11-4 and give further importance to carry out clinical studies and to authenticate its efficacy over other remineralizing agents in a large sample group with long-term evaluation. SAP P11-4 showed superior remineralization with higher Ca: P ratio and uniform mineral deposition on incipient lesions compared to CPP-ACP. Moradian-Oldak J. Protein-mediated enamel mineralization. Front Biosci (Landmark Ed) 2012;17:1996-2023. Featherstone JD. The science and practice of caries prevention. J Am Dent Assoc 2000;131:887-99. Kind L, Stevanovic S, Wuttig S, Wimberger S, Hofer J, Müller B, et al. Biomimetic remineralization of carious lesions by self-assembling peptide. J Dent Res 2017;96:790-7. Kyle S, Aggeli A, Ingham E, McPherson MJ Production of self-assembling biomaterials for tissue engineering. Trends Biotechnol 2009;27:423-33. Narayana SS, Deepa VK, Ahamed S, Sathish ES, Meyappan R, Satheesh Kumar KS, et al. Remineralization efficiency of bioactive glass on artificially induced carious lesion an in-vitro study. J Indian Soc Pedod Prev Dent 2014;32:19-25. Arslan S, Zorba YO, Atalay MA, Özcan S, Demirbuga S, Pala K, et al. Effect of resin infiltration on enamel surface properties and Streptococcus mutans adhesion to artificial enamel lesions. Dent Mater J 2015;34:25-30. Jablonski-Momeni A, Heinzel-Gutenbrunner M. Efficacy of the self-assembling peptide P11-4 in constructing a remineralization scaffold on artificially-induced enamel lesions on smooth surfaces. J Orofac Orthop 2014;75:175-90. 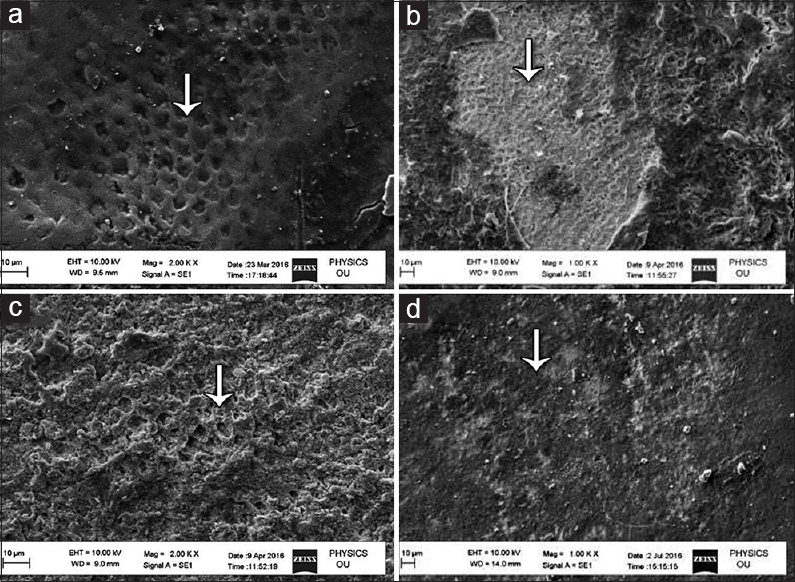 Hegde MN, Moany A. Remineralization of enamel subsurface lesions with casein phosphopeptide-amorphous calcium phosphate: A quantitative energy dispersive X-ray analysis using scanning electron microscopy: An in vitro study. J Conserv Dent 2012;15:61-7. Mehta R, Nandlal B, Prashanth S. Comparative evaluation of remineralization potential of casein phosphopeptide-amorphous calcium phosphate and casein phosphopeptide-amorphous calcium phosphate fluoride on artificial enamel white spot lesion: An in vitro light fluorescence study. Indian J Dent Res 2013;24:681-9. Roopa KB, Pathak S, Poornima P, Neena IE. White spot lesions: A literature review. J Pediatr Dent 2015;3:1-7. 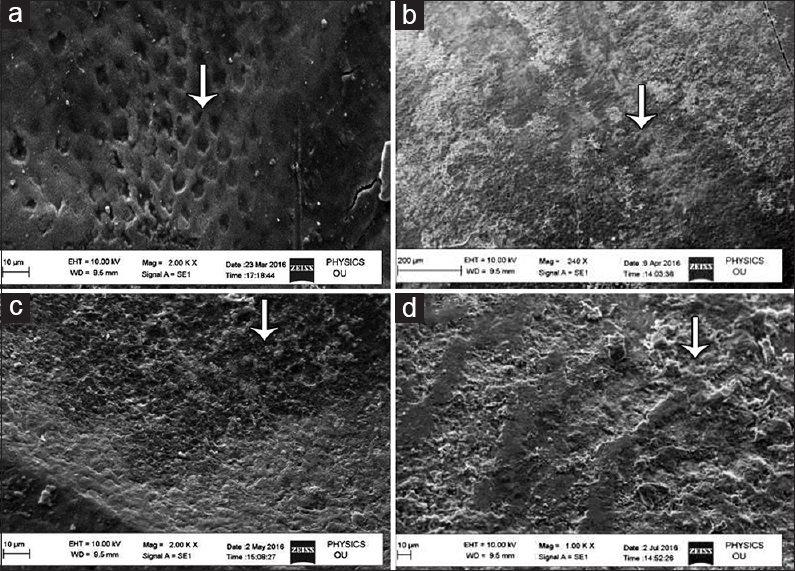 Kodaka T, Debari K. Scanning electron microscopy and energy-dispersive X-ray microanalysis studies of afibrillar cementum and cementicle-like structures in human teeth. J Electron Microsc (Tokyo) 2002;51:327-35. Takahashi F, Kurokawa H, Shibasaki S, Kawamoto R, Murayama R, Miyazaki M, et al. Ultrasonic assessment of the effects of self-assembling peptide scaffolds on preventing enamel demineralization. Acta Odontol Scand 2016;74:142-7. Thomson BM, Hardaker L, Davies RP, Dennis C, Bronowska A, Aggeli A. P11-15 (NNRFEWEFENN): A Biocompatible, Self-assembling Peptide with Potential to Promote Enamel Remineralisation. Paper Presented at: 61 ORCA Congress. Greifswald, Germany: Abstracts. Caries Research 2014;48:384-450. Kirkham J, Firth A, Vernals D, Boden N, Robinson C, Shore RC, et al. Self-assembling peptide scaffolds promote enamel remineralization. J Dent Res 2007;86:426-30. Aggeli A, Bell M, Boden N, Carrick LM, Strong AE. Self-assembling peptide polyelectrolyte beta-sheet complexes form nematic hydrogels. Angew Chem Int Ed Engl 2003;42:5603-6. Zhao Q, Cai F. The remineralization of enamel lesions by casein phosphopeptide-amorphous calcium fluoride phosphate in vitro. Zhonghua Kou Qiang Yi Xue Za Zhi 2001;36:421-3. Zhou C, Zhang D, Bai Y, Li S. Casein phosphopeptide-amorphous calcium phosphate remineralization of primary teeth early enamel lesions. J Dent 2014;42:21-9.